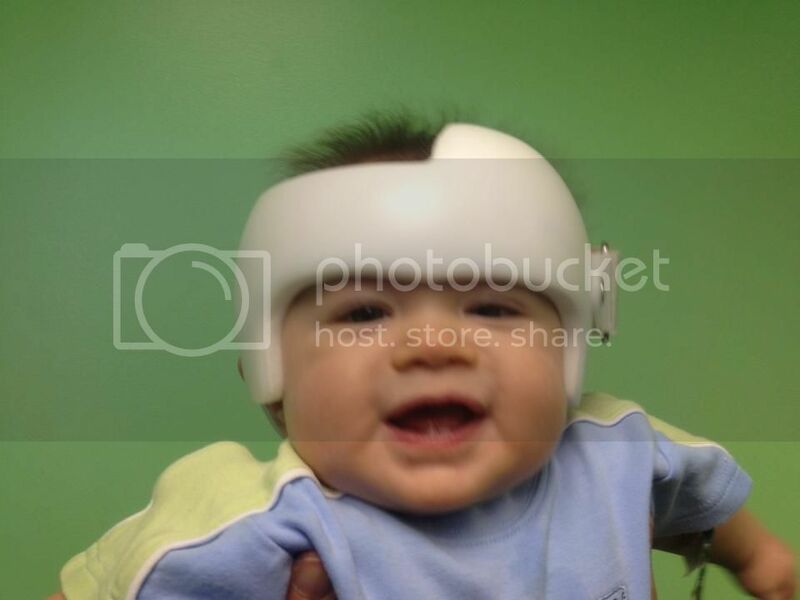 It's been nearly two weeks since the Blueberry was outfitted with his cranial helmet. It's officially called the Doc Band and is used by the folks at Cranial Technologies. Let's just say that's I'm unimpressed. I'm not entirely certain what I was expecting, but this wasn't it. The helmet is essentially styrofoam covered in a layer of plastic. It's extremely ill-fitting and causes red pressure marks all over his head. (So much for the super fit they claim to get as a result of their 360 degree picture.) We've been back and forth a couple of times already to get the fit acceptably right. At first, they instructed us to inform them if red marks lasted for more than an hour. After two "adjustments", which simply means sanding down some of the styrofoam, the tech said she was okay with "light pink." Boo. Oh, and little details no one mentioned before we got it: that it will take a week or better for him to get used to sleeping with the helmet on; it will smell like a dirty sock over time; and it will pinch his eye. Though the sleeping aspect is annoying (I think he might have slept one night it in it thus far and wakes up every 30-60 minutes when he does sleep in it), what I'm bothered most is the pressure it places on his eyes, particularly his left. It makes him look like he's frowning! My happy baby now has a near perpetual frown. I also worry that it might cause him to have a lazy eye or in some way inhibit the proper development of that side of his face. Here he is at the "fitting" appointment. They made a little more room for his eye than shown here, but not much. 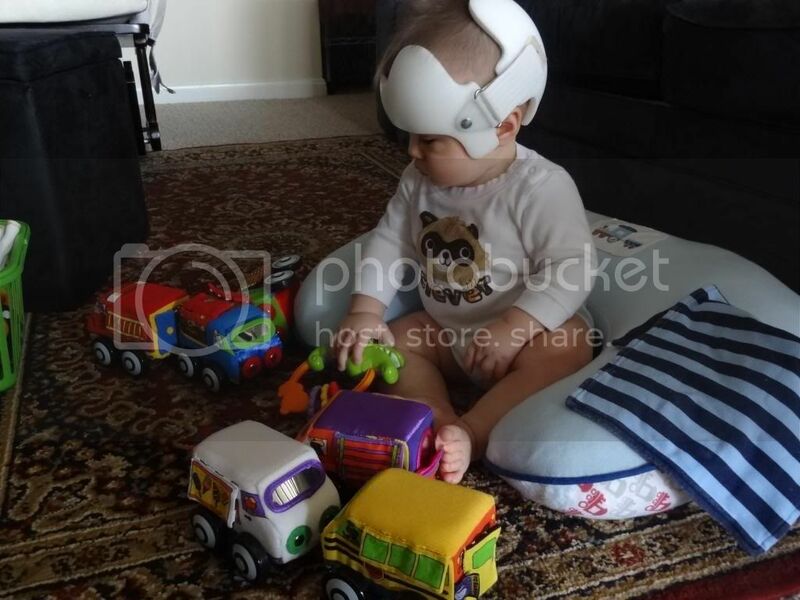 Despite Mom's worries, for the most part he ignores the helmet during the day. Obviously, he has more important things to concern himself with. "Enough picture-taking, Mom!" 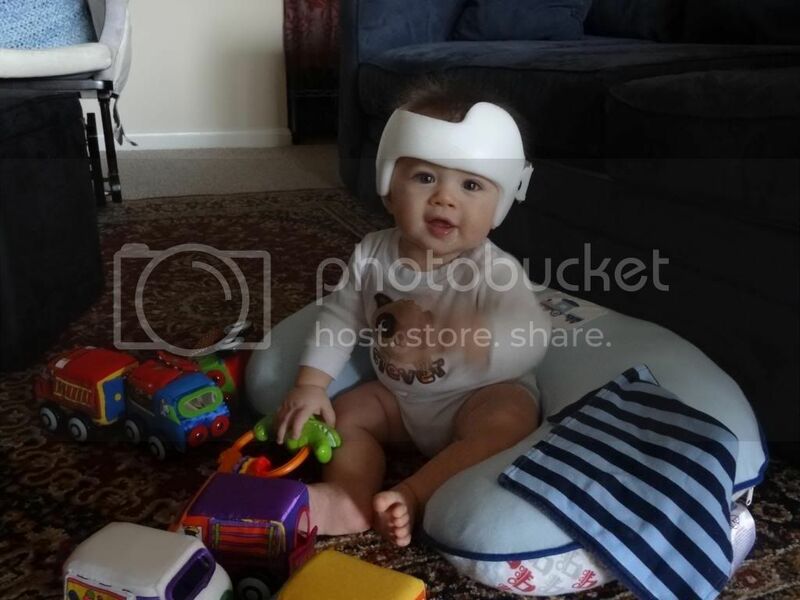 Supposedly letting him sleep in places other than his crib led to his flat head and a need for the cranial helmet which I currently hate. The irony of it is that since getting it he's fallen asleep in places/positions he never has before. 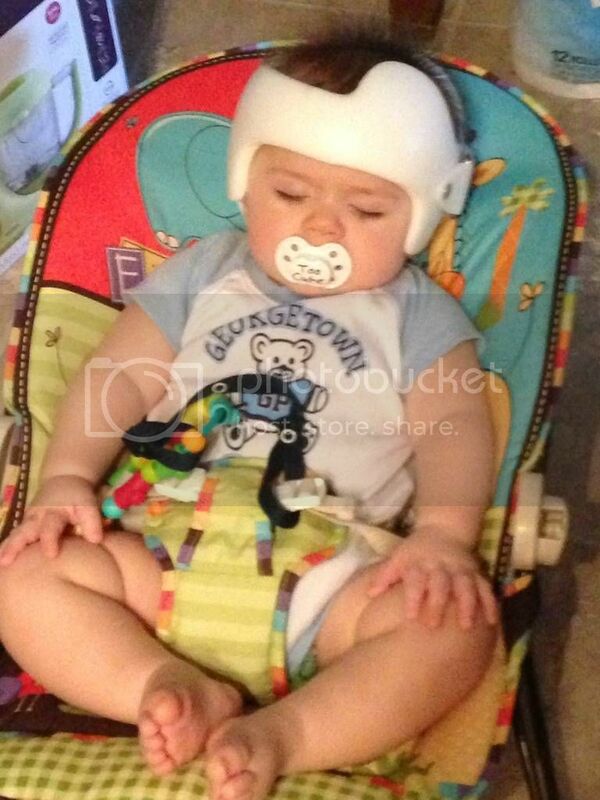 Poor little guy...he's probably exhausted from the crappy night's sleep in that thing last night. We made it till 130am sleeping in 30-60 minute increments or less before Mommy gave up. Argh! 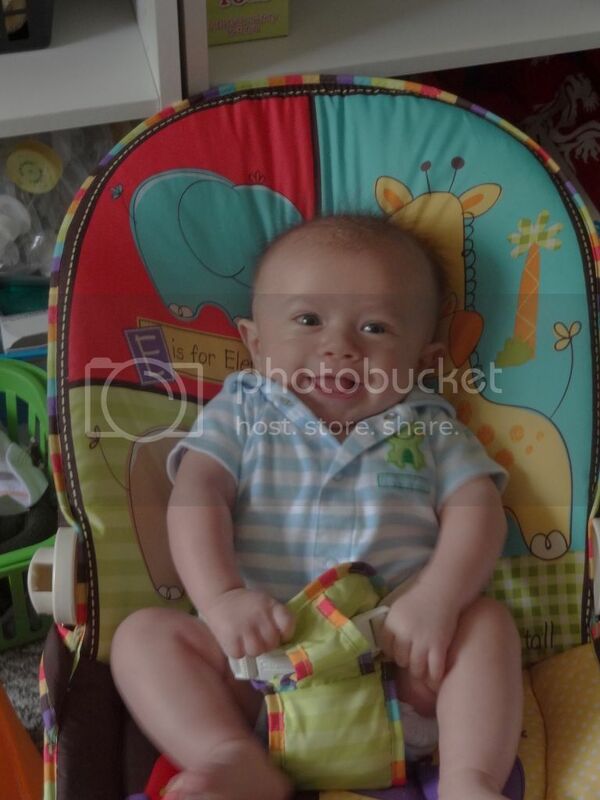 In other news, I can't believe how much he's grown! I know this blog is in desperate need of an update. Unfortunately, I don't have time for that now. However, I just checked my camera for recent pictures and had to share this one from yesterday. After about a week of yucky weather, yesterday was bright and sunny. 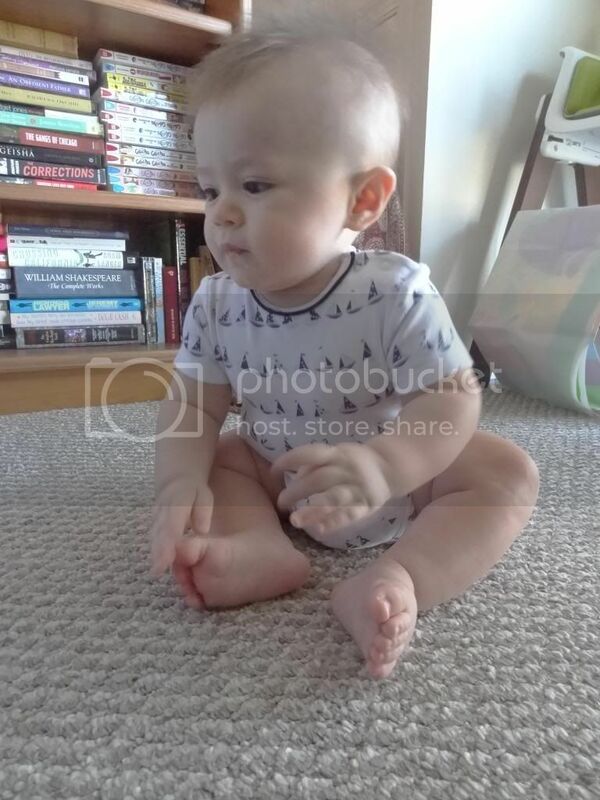 As you can see, he's doing great sitting up. It's a matter of whether he wants to or not. He can go for 20 minutes or more of sitting up when placed in upright, but still hasn't quite grasped the consequences and will suddenly slump over to the side or kick back with a thud (and cry). However, just this past week he began using his tummy muscles to return to a fully upright position from about a 45-60 degree angle. Sitting all the way up can't be too far off.